Calculate Your BMI and Discover Which Bariatric Surgery is Best For You. This tool will provide expected weight losses based on your current height, weight, duration, procedure and more. 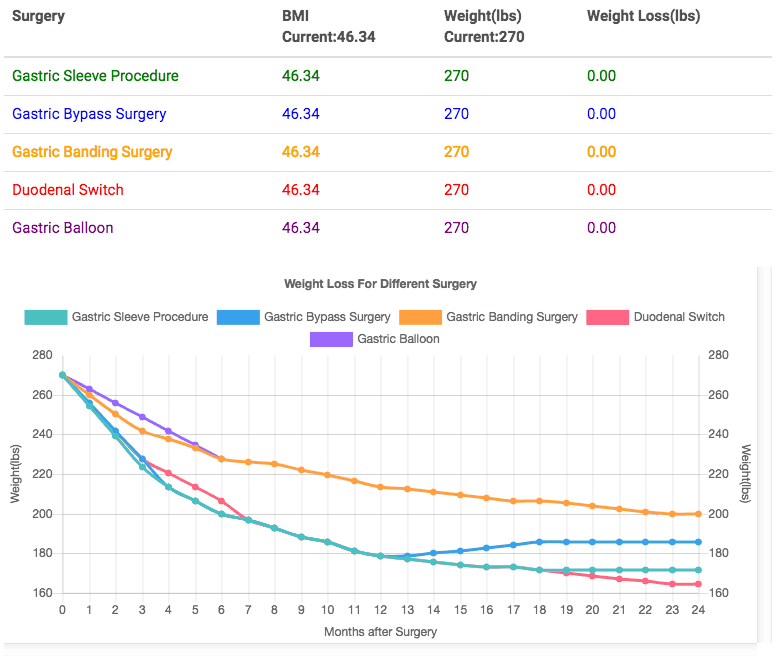 Use the pop-up calculator to compare bariatric surgeries to find which surgery type will provide the highest excess weight loss. Obesity puts you at risk of many diseases. It compromises your quality of life, increases health care spending and put you at risk of untimely death. You are prone to discrimination and stigmatization at work and in public places. Hence, the need to look for the most effective way of losing that excess weight, improving your health status and ability to compete favorably with other healthy-weight individuals. Bariatric surgery refers to the operative management of obesity that is aimed at achieving weight loss. It has been shown to be the most effective solution in those who have failed to deliver satisfactory weight loss with non-surgical techniques. Many of them are available, but the common ones are Laparoscopic adjustable gastric banding, Gastric sleeve surgery, Roux-en-Y gastric bypass and Biliopancreatic diversion with duodenal switch (BPD-DS). The question of “which bariatric surgery is the best” may not have a simple answer as all of them have their pros and cons but what is common to all is the proven effectiveness regarding weight loss and reversal of comorbid conditions. Failure of other non-surgical treatment modalities with the risk of obesity-associated morbidity and mortality. After confirming that you are eligible for bariatric surgery, the next step is to determine the best bariatric medicine for you. Although the eligibility criteria stated above are for all forms of weight loss surgeries, there are individual patient differences which may favor the choice of one bariatric surgery over another. Also, your final aim may also influence the decision of operation. Do you want a procedure that is reversible? What is your excess weight loss target? Do you have any other disease that makes you a high-risk patient for a particular procedure? The definition of “best bariatric surgery” therefore depends on individual patients and their most desired outcome, e.g., bariatric surgery with the highest weight loss or one with the lowest rate of complications or affordable bariatric surgery. If you are looking for a procedure that will not alter the anatomy of your gastrointestinal tract or a process that is reversible, then laparoscopic adjustable gastric banding will be the best bariatric surgery for you. This procedure only limits your stomach size with a flexible silicone device that can be removed. However, it offers an average excess weight loss that is usually less than 50%, the least among the four procedures mentioned above. The failure rate is also high, thus necessitating removal in some patients. For those with BMI greater than 50kgm-2 and desire to get the maximum weight loss possible, Biliopancreatic diversion with duodenal switch (BPD-DS) may be the best bariatric surgery for them. This procedure limits the stomach capacity and also reduces absorption of nutrient from the intestine. Up to 78% of the excess weight can be lost within 12-18months. The drawback of this procedure is that it is irreversible, has the highest rate of complications and is also the most expensive bariatric surgery in most centers. Patients are often placed on nutritional supplements for life. Therefore, most surgeons prefer to go for it as the last option when others have failed. For obese patients with heartburn due to gastro-esophageal reflux disease (GERD), gastric bypass surgery may be the best bariatric surgery for them. It has been shown by different studies that Roux-en-Y gastric bypass results in symptoms improvement in those with GERD. The weight loss is substantial only second to what is obtained after BPD-DS. For us, the best bariatric surgery should have a minimal alteration of the digestive tract anatomy, satisfactory weight loss, fewer complications, meager mortality rate, optimal improvement/reversal of comorbidities, affordable and low failure rate. Gastric sleeve surgery offers almost all these benefits. It involves the resection of the stomach to limit food intake, the intestine is left undisturbed, and the complication rate is low. The estimated weight loss is usually about 60% of excess weight. Although nutritional supplements may be required after the surgery, it is short-term. In conclusion, which bariatric surgery is best for you, is a question that can only be answered by your doctor after a thorough evaluation of your clinical status and consideration of your optimal goal.